When you publish a new blog post how do you get the word out? Do you manually go to several different social networks and share your post? Or do you let a WordPress plugin or Web service do the work for you? Sharing manually is nice because you can add a personal touch to each post as opposed to sending out the same thing to all of your social networks. However it is a time-consuming process. Some days you just may not have the time to share your new content manually. This is why many bloggers opt for automatic sharing, which is not only easier, but more convenient. There are many ways that you can automatically share your content on the Web, and we’ll go over 8 of those methods below. Publicize is part of the popular Jetpack plug-in. It is an obvious choice for automatically sharing your posts on several social networks at once, since many blogs are already using Jetpack. You can currently share to Facebook, Twitter, LinkedIn, Tumblr, and Yahoo. Setup is easy and done via the Sharing sub-menu under Settings. 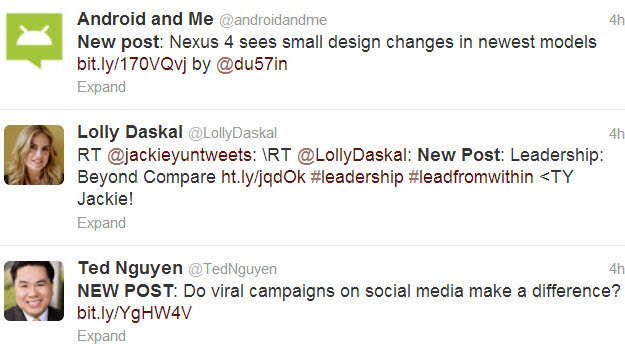 You can choose which posts to share and which social networks to share to on a post-by-post basis. 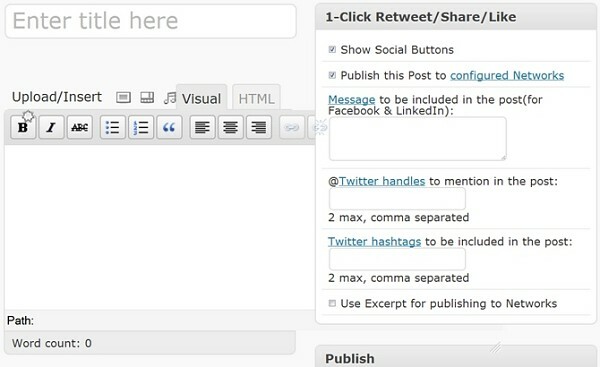 This plug-in automatically shares your posts to Facebook and Twitter, along with a predefined message. 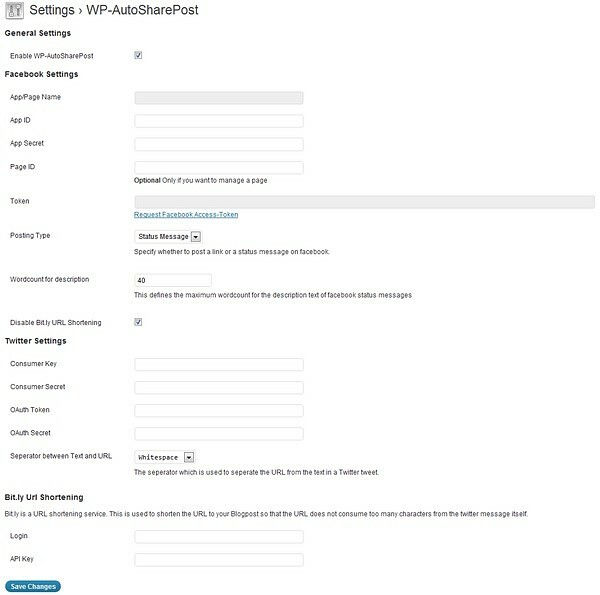 WP-AutoSharePost is a bit more technical than Jetpack Publicize, since you’ll have to create a Facebook app and Twitter app in order to share your posts. However it supports Bit.ly URL shortening, which is great for tracking your links. Additionally the plug-in grabs comments from Facebook (related to the post) and adds them to your blog comments section. 1 – Click is a plug-in with many features, including the option to automatically share your blog posts on 30+ social networks. 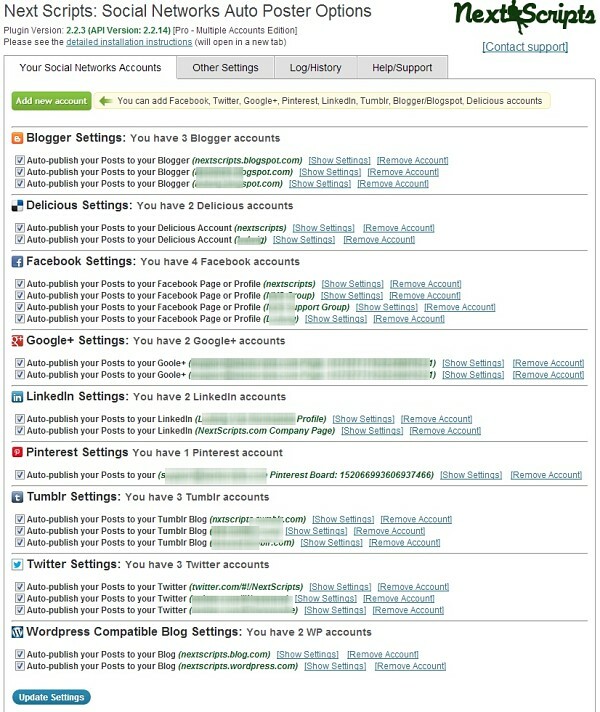 You can automatically share to: Facebook, Twitter, LinkedIn, Delicious, Diigo, Tumblr, Foursquare, and more. You can also customize the message to be included with your shares to Facebook and LinkedIn on a post-by-post basis. 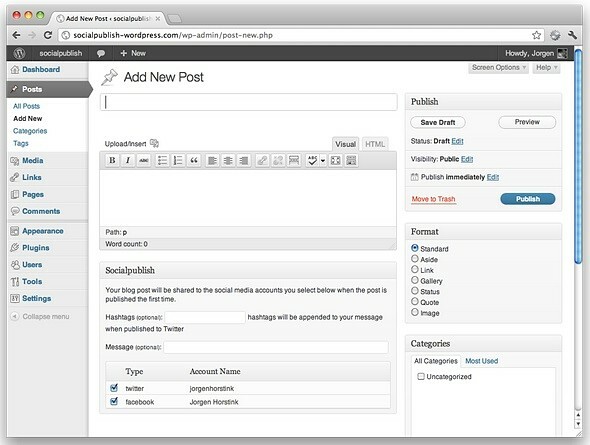 SocialPublish shares your blog posts to Facebook and Twitter as soon as they’re published. 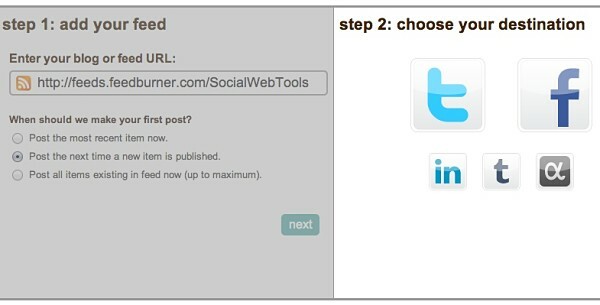 You don’t have to create any Facebook or Twitter apps to use this plugin. Simply sign up for a SocialPublish account (it’s an actual Web service) and then connect your accounts. 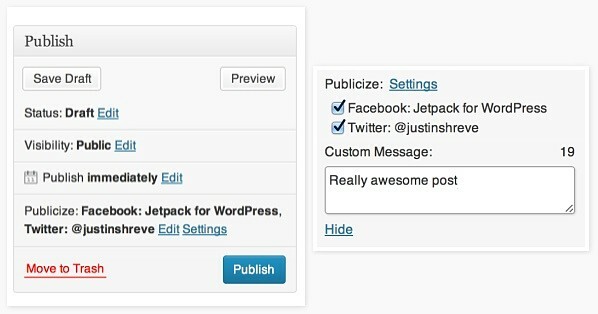 Like Jetpack Publicize, you can choose which social networks to share to for each post. You can also choose to add a custom message but it is not required. 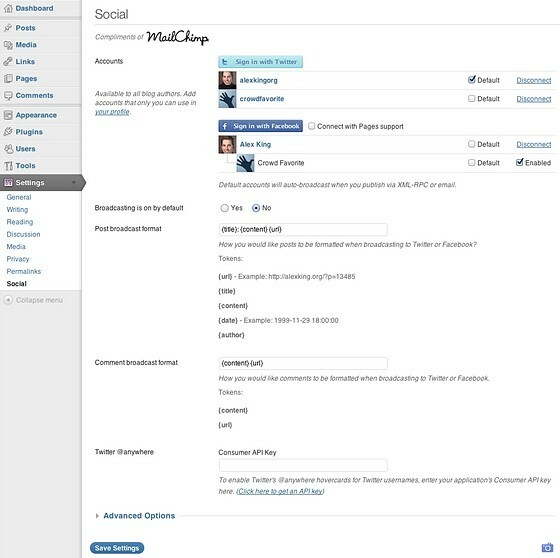 NextScripts is by far the best plugin for auto-posting to numerous social networks. It supports 18 social networks (more coming soon) including Facebook, Instapaper, Google+, LinkedIn, Pinterest, StumbleUpon, Tumblr, Twitter, YouTube, and more. You can even post to multiple accounts on the same social network (i.e. multiple Twitter accounts, multiple Facebook pages). The plugin makes 100% white labeled posts, meaning the posts will look as if you posted them directly – no “shared via NextScripts.com or posted by SNAP for WordPress” messages. Social is another plug-in that only shares to Facebook and Twitter but it goes a step further by pulling in reactions (from Facebook and Twitter) and displaying them inline with your regular comments. You can publish to multiple accounts on the same social network, and you can customize the messages associated with your posts. Social requires the use of custom apps in order to share to your accounts. Although Dlvr.it is a Web service as opposed to a WordPress plugin, it’s still an excellent tool to automatically distribute your blog to your favorite social networks. Dlvr.it supports Twitter, LinkedIn, Facebook, Tumblr, and App.net. Once you sign up, simply enter your RSS feed, choose the social network you want to post to, and you’re all done. Dlvr.it also lets you post to Google+ Pages, but only if you upgrade to a Pro or Ultimate plan. IFTTT is my preferred method for automatically sharing my blog posts. I use recipes for each of the blogs that I own and for the blogs that I contribute to. Each recipe involves the Feed channel (or you can use the WordPress channel) along with a social channel like Twitter, Facebook, Buffer, and HootSuite. This makes it easy to keep up with all of the blogs that I’m sharing from within a single interface. My favorite thing about the IFTTT method is that I can send new RSS feed items (new blog posts) to Buffer and HootSuite, two services that let you schedule your posts as opposed to having them all post at the same time. This helps to cut down on noise and makes your shares look more natural. So now that I’ve gone over 8 ways to automatically share your blog posts to social media sites like Facebook and Twitter, let us know which method you use. Do you choose to manually share your blog posts? or do you prefer to share them automatically via a method above or another method?